Kanazawa – How do you separate carbon dioxide from carbon monoxide? One way, showcased by a new study from Kanazawa University, is to use a bowl of vanadium. More precisely, a hollow, spherical cluster of vanadate molecules can discriminate between CO and CO2, allowing potential uses in CO2 storage and capture. At the molecular scale, small objects can fit inside larger ones, just like in the everyday world. The resulting arrangements, known as host-guest interactions, are stabilized by non-covalent forces like electrostatics and hydrogen bonds. Each host will happily take in certain molecules, while shutting out others, depending on the size of its entrance and how much interior space it can offer the guest. 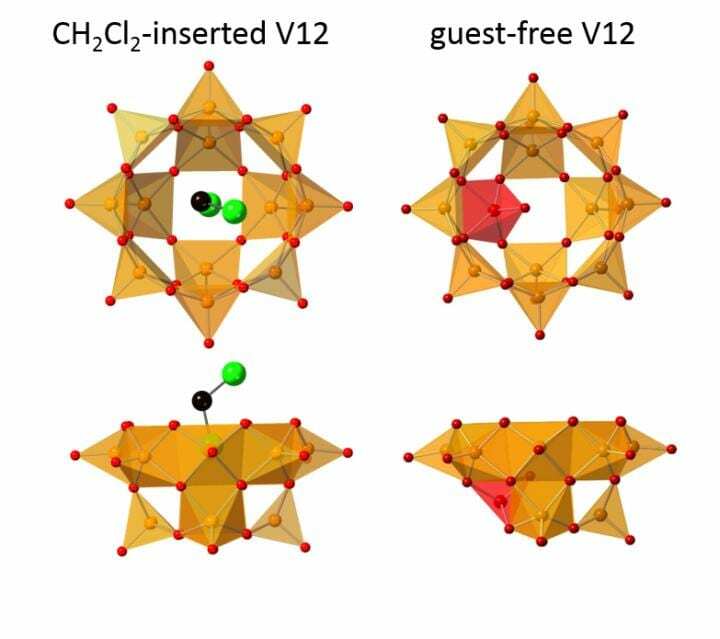 Each vanadium atom in V12 forms a square-pyramid with five oxygens. The oxygens of each VO5 point outwards, while the positive charge from vanadium fills the inner cavity, helping to stabilize electron-rich (or anionic) guests. However, the Kanazawa team created a guest-free V12 for the first time, by using a solvent–acetone–whose molecules are too bulky to fit through the entrance.